I’ve heard a lot of parents say that kids bedrooms should be neutral spaces so that they’re easy to redecorate as they grow up. However, I am a big believer in making children’s bedrooms places that are as fun and enjoyable as possible. It is their bedroom after all, so it should be somewhere that they love spending time in. Plus, if your child likes their room, they’re more likely to sleep in their own bed, instead of yours. Your child’s room should not only be a fun space but also, somewhere that is creative. That’s why, when it comes to the decor and design, you need to think like a child. Ask yourself what is your child’s favourite colour? Who is his or her hero? What games does he or she love to play? When it comes to designing a space your child will like, it’s all about thinking like them. 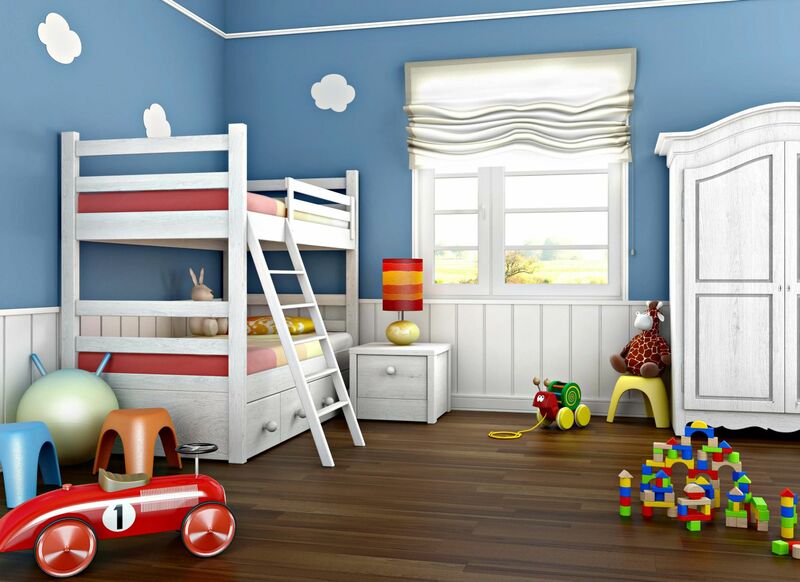 To help you design a bedroom that your child will love spending time in, here are a few tips and ideas. 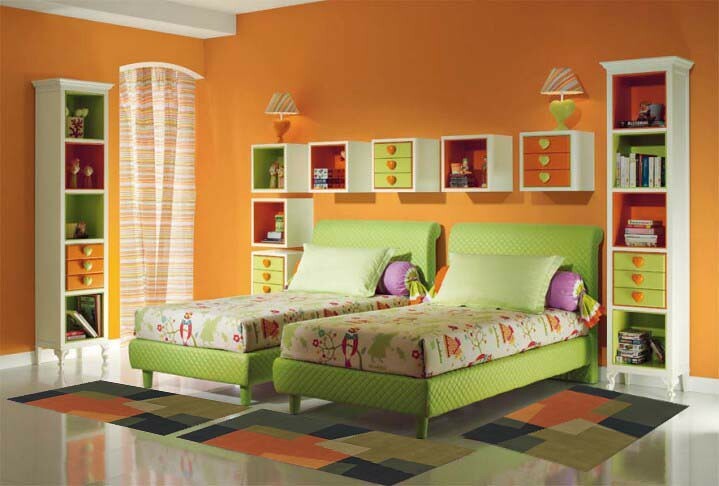 For a child’s bedroom, bright colours are a must. If you design a bedroom that’s a dull, dreary space, the chances are that your little one won’t want to spend time there. However, if you pack the space with colour, they’re bound to love it. The easiest way to add colour to the space is by painting the walls in a bright shade of their choice. Or using wallpaper, to add extra colour. However, if you live in rented accommodation, the chances are that you’re not able to use paint or wallpaper. The fact that you’re not allowed to make any permanent changes doesn’t have to affect how colourful the space is. As instead, you can add colour with accessories. Bright and bold curtains, rugs, wall art, bedding, and storage space, can be all it takes to create a beautifully colourful space. Instead of using ornaments for decor, as you would in an adult space, use toys. This gives the room a more fun and child-like vibe. As well as using actual toys as decor, look online for decor that is designed to look like toys. For instance, you can get storage space that is designed like a race car or a fairy castle. Or, rugs that are shaped like a football or flower. On the walls, instead of hanging wall art, consider using board games. You’ll find plenty of sites online sell board games that come with hooks and can be used as an alternative to wall art. These can make the room feel more fun and more child-friendly. When it comes to choosing the bed, it’s a good idea to think carefully about the design that you opt for. While it’s true that a plain frame design will grow with your child, it’s not as fun or exciting as a bed that’s a little different. For a bed that will allow your child’s imagination to grow, check out these unique cabin beds from Cuckooland. While they might cost a little more than a regular bed frame, they are ten times more exciting. For lampshades, get creative. Don’t just opt for boring ones, think outside the box. Instead of a normal lampshade, how about one shaped like the globe? To get an idea of what lampshade designs there are to choose from, have a look online. If you know where to look, there are some excellent novelty ones that kids will love. Little kids are often scared of the dark, so it’s important to be creative with lighting in their room. On the ceiling, pop glow-in-the-dark stars, so that even when the lights are off, they can still see what’s around them. It’s also a good idea to add a nightlight beside the bed so that if they wake up in the night, they’re not scared. So if you want to design your child a bedroom that he or she loves, take note of the kids bedroom ideas above. "Looking For A Great Read? Beck Valley Books – The Top 6 Reviewers’ Choice 2015"